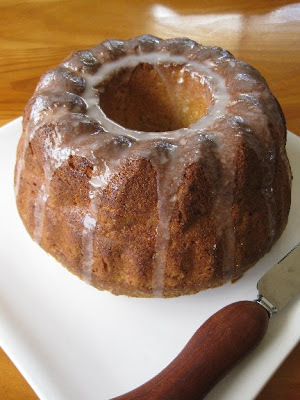 This week Mary of The Food Librarian chose the Classic Banana Bundt Cake. If you've read Mary's blog you'll know this wasn't a huge surprise - she is the queen of the bundt! After reading the P&Q for this recipe I decided my current bundt pan wouldn't be big enough (and I was right, this cake was huge!) so we went on the hunt for a new one at Kitchenware Plus down at Loganholme. For a kitchen gadget junkie like myself this place is nirvana! I found a Wilton bundt pan within a few minutes. Perfect. Then I checked the price ... $84.95!! For a cake pan?? Granted it's a great brand and clearly great quality too but that is just ridiculous. I ended up going with a 12 cup silicone pan for just $27.95 instead. This was a breeze to whip up but I was really annoyed with myself for not buying bananas ahead of time and letting them ripen up. All the bananas I found were a little green and even after a night sealed in a paper bag there were still no where near what I would have liked. I made the recipe exactly as stated except for using half regular and half gluten free flour. I also accidentally added baking powder instead of baking soda but that didn't seem to do any harm! This is one moist cake! I was a little worried as it took FOREVER to cook (about 90 minutes instead 65-75). It just didn't have quite the banana hit I was hoping for but that will be easy fixed for next time. The lemon glaze was delicious too. Your cake looks lovely with the glaze! Is there a taste difference with gluten free flour? Hi Clivia, no one one could taste any difference but there was a difference in the consistency as I mixed it - very thick and almost gelatinous - probably from the guar gum in the gluten free flour mix. Mite have been the unripe bananas. Try it again. i have never heard of a bundt pan costing almost $90-- that's nuts! i see the one you did get works perfectly! So beautiful and light in color. I love your bundt pan. Your cake looks so soft and creamy! Youcan see the brown banana specks in mine! This recipe was so good! Hi Flourchild - I think that's because my bananas were a bit green. I would've liked it to have the brown specks! Sheesh! Was that pan made of gold or something? Crazy. The cake looks wonderful. Your cake looks SOOO great!! The glaze really knocks it up. We loved it, I think I may have one slice remaining..
that 90 dollar bundt pan must of been made of gold! yikes! $85 for a bundt pan??? Wow, I can't get my head over that one. That's ridiculous! 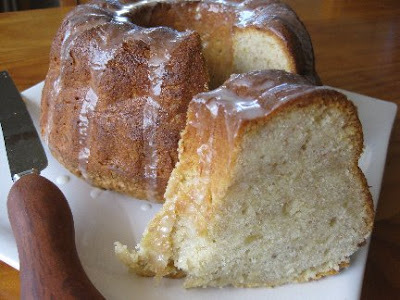 The bundt pan you ended up with turned out a beautiful looking banana bundt cake! I love the glaze on it! It looks so light and moist - I'm surprised it was in the oven for 90 minutes. Mine was in for 65 minutes and came out pretty dark.